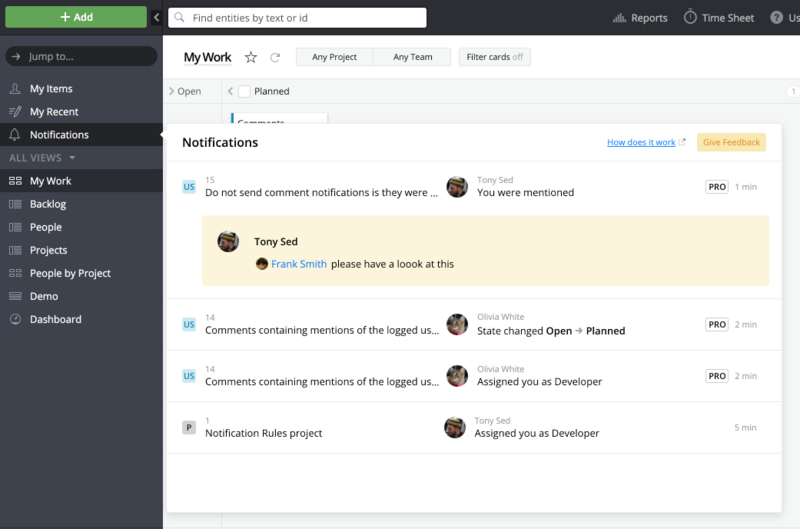 We are working on a new way to handle notifications, we call them Notifications Rules, they will provide more flexible conditions for notifications (no more spamming all project members!) and support more ways of letting you know something important happened through new options like in-app notifications or slack messages. The functionality that is ready so far is pretty close to the legacy notification options, but we wanted to share it with you so that we can improve it based on your feedback. Notification rules allow you to keep track of changes to Targetprocess entities by configuring and sending notifications into targetprocess application or into email. In the current version, only administrators of an instance can set up notifications for any other Targetprocess user. 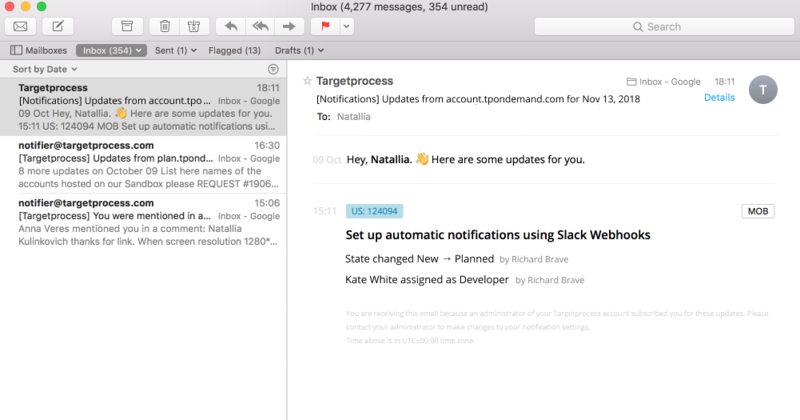 Here you can define where to send notifications, who will receive them and what changes will trigger them. Let's have a look at a simple example below. Whenever a User Story in Project 'Mobile' makes it to the state 'Planned' we would like to notify all the members of the Teams assigned to this User Story. The overall logic is based on Projects. You can create any number of notification rules that make sense for as many of the projects existing in the instance as you want. Each of these rules defines when, whom, and where to send the email notification to. Let's get deeper into these steps. Go to Settings -> Notification rules page. 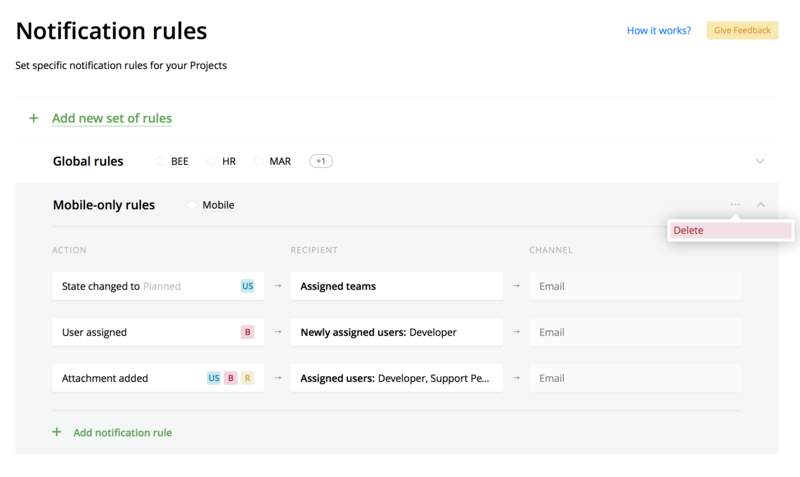 For example, you want to create rules for the ‘Mobile’ project. Click on ‘Add a new set of rules’ button and select ‘Mobile’ project in the appeared 'Projects’ dropdown list. Then press ‘Next’. You will see an empty container named ‘New set of rules’ claiming that There are no rules set for selected Projects. You may want to update the list of selected Projects. For this, put the mouse over the Project name and click to edit. You can do the same for the set's name. As soon as you successfully create set of rules, let's go ahead and add notification rules. Click on the ‘+ Add notification rule’ link to add the rules. You will see three blocks: Action, Recipients, and Channel. The Actions selector is expanded by default. Fill in Action, Entity types, Recipients and Channels. And voila, the rule is successfully created! Rules work for entities and people assigned to Projects selected for the Set of Rules. If Action, Entity type, or Recipient is empty the rule will not work. State changed: an entity changed its state. You can also specify the state in which entity should appear to trigger a notification. User assigned: a person is assigned to an entity. If you select Project as entity type, then it's the user who assigned as project member. User(s) are assigned to an entity under some role. This role is considered by the rule. Newly Assigned Users: means only the latest assigned user with a specific role. Available for 'User Assigned' action only. It’s useful when you don’t want to send notifications about 'User assigned' to all of the previously assigned people but only to the user that was just assigned. Requesters: all the people assigned as Requester. The option is available for Request entity type only. Actions, Entity types and Recipients fields depend on each other. Actions selector acts as the main field while Entity type and Recipients lists depend on it. We send notifications into email specified in User's profile. Frequency is currently locked at 5-25 minutes. Notifications appear immediately in 'Notifications' feed located in targetprocess application, we don't group them. Let's test the added rule to confirm that it works. You can delete a notification rule by clicking the ‘...’ menu that appears at the end of the corresponding rule. Hover over the rule and click the 'Delete' menu item. The same goes for a set of rules. By deleting set of rules all the rules included in it will be deleted. How can I migrate Process-based notifications into new ones? - Create a rule from the Notification Rules interface. - Make sure that you receive the correct email. - Delete the original rule in Process notifications. If you create notifications using the new Notification Rules interface and leave the same notifications in Process setup - you'll receive duplicate emails. Currently, we do not have the option to disable all notifications so the only way to stop receiving them is to delete them.